Balance : How I Learned its Importance the Hard Way! I've learned the hard way that in today's busy, modern world achieving balance and avoiding overwhelm doesn't happen by magic. To help you avoid overwhelm while building your business, I'd like to share my story with you, along with my tips for avoiding overwhelm and an 8-page workbook you can download for free and use to help you design - and maintain! - your ideal life balance. I can't recommend enough that you do this, it could save you a lot of time, frustration and pain! 10 years ago my life changed dramatically when I left my 15-year career in marketing and communications to start my own business. This decision surprised everyone - including myself! You see, I loved my job and just a few months earlier I'd been given an important promotion that saw me report directly to the CEO – my dream boss. But I wanted more balance in life, and my desire to find it was stronger than my desire to stay in my job. I'd recently given birth to my first daughter and the moment I held her in my arms, everything changed. I became determined to find a way to work around my new family, part-time work wasn't an option at my company, so I decided to leave start my own business. I was both excited and terrified. I had no idea if I could do it and I worried about everything! How could I find clients? What would other people think? As a new Mum, would I be seen as credible? Did I really have enough time? But the thought of going back to full-time employment and only seeing my daughter for fleeting moments each day worried me a lot more. So I knew I had to at least try. In the wise words of Shakira – birds don’t just fly, they fall down and get up. That’s what I needed to do, I needed to take the jump and see if I could fly, even if it involved a bit of flailing around while I figured things out. And I am so thankful that I took that jump as it taught me that I can do an awful lot more than I ever thought possible. And being my own boss enabled me to engage in meaningful work and have the time I wanted with my children and I was extremely happy....at first. Fast-forward seven years and I was a wreck. I was stressed out, exhausted, overweight and miserable. I was suffering adrenal fatigue, and heading full-pelt towards a burnout. I found it hard to motivate myself to get up in the mornings and as a result, my kids were always late for school – adding 'Mum Guilt' to my list of miseries. It was months before I really woke up to the problem - an emotional break-down in the school car park was the start of it. I couldn’t speak, I just nodded in agreement and went home. 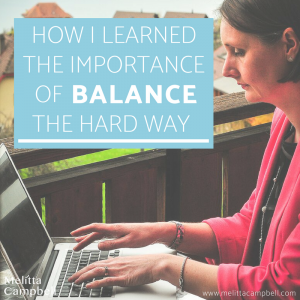 What went wrong was I'd lost sight of my goal – to have balance. My life had become entirely focused on caring for my kids and my clients and I’d forgotten to care for myself in the process. I think I just accepted that that's how life as a Mum and Entrepreneur was supposed to be. As my family grew I had more and more demands at home. At the same time my reputation and client list grew too – along with their expectations. I started working late nights and weekends just to keep up and my days were a blur. Painful as it was, looking back at this time, I am so grateful. Sometimes we have to hit rock-bottom to wake ourselves up to our problems. That experience taught me that failure and adversity can be good; and even necessary sometimes. They give us valuable perspectives, shine a light on our strengths and help us build the confidence and self-esteem we need to step up and into our real potential. My failure taught me that I’d lost sight of myself and my vision for a balanced life. I'd left my corporate life so I could enjoy more balance, and I learned the hard way that balance doesn't just happen, it’s something you have to consciously create. Creating balance is all about how you choose to spend your time. Time working, time with friends and family, and time for yourself. Interestingly, when designing your ideal balance, stress isn’t the problem. Dr. Nick Hall’s studies have shown that there is no such thing as too much stress. He explains that the human mind and body can endure massive amounts of stress. In fact, he advocates that stress is beneficial – it forms us, makes us strong and helps the human race grow and move forward. And I admit, that much of my best work has been done under pressure of looming deadlines. However, he explains that problems arise when there is not enough anti-stress; times of relaxation and joy that allow the mind and body to relax and recover. That’s what I’d lost sight of. I was working hard for everyone else, but never taking any time out to create moments of peace and joy for myself. And it’s true when they say you can’t pour from an empty cup – I was depleted; there was nothing left for me to give and I started to suffer. It was a hard lesson for me to learn, but now I never underestimate the importance of having real balance in life and I appreciate that it takes work and focus to achieve it. Today, I don’t just set myself personal and business goals, I also set habit goals that reinforce positive habits such as taking time for my health and for the activities I love. I have split my time between Work, time with Friends and Family and time for Myself, I've mapped out my ideal balance and I fiercely guard it. There is always something else I can be doing to support my business or those I love - but not at the detriment of my own health and sanity. I’d like to urging you to take a close look at your own life balance and how you choose to spend your time. The 'Find Your Ideal Balance' workbook will guide you in finding your ow perfect balance (see download link below). Ask yourself, do your days include enough moments that bring you nothing but joy or relaxation? Have you built healthful practices into your daily routines? Is your day filled with activities that you care about, enjoy or take you closer to your goals? Anything that doesn't tick one of these boxes should be removed or delegated. Get clear about the life you want, go out and make it your reality. Bit by bit, day by day. And always remember, life is to be enjoyed and that joy is firmly in your hands! Do you have any key strategies or methods for maintaining balance in your life? Share your ideas and feedback in the comments below - I'd love to hear your experiences and stories! I love helping people.That takes a lot of my time.I need to step back and think of myself more.Someone said ‘You care about people too much’.Managing oneself to stop ✋ at a certain point would be good.I could be wasting my time uneccessarily. Such great reminders. We have to put ourselves first in order to take care of others. Easier said than done. Thanks Katie, and you’re right it’s not always easy – but self-discipline takes self-discipline and what gets scheduled gets done, so there are definitely ways to ensure you invest enough time and energy in self-care and counter-stress activities. I love reading about other people’s experiences with stress–your honesty is inspiring! I love the idea of dividing your time and focusing on just one aspect at a time. If I tell myself that it’s “self time” rather than “work time” then maybe I would actually work out instead of keep working 🙂 Thanks for the tips, Melitta! Some of us “A” types are more prone to burnout than others. I’ve suffered adrenal fatigue and learnt the hard way to ensure there is time for myself. Your honesty reminds us we need to remember ourselves first. Thank you Jen, sorry to hear that you’ve learned this lesson too – but I’m sure that you’re all the stronger for it now and enjoying a more balanced life too. Very interesting post! I have recently quit corporate life myself, so your advice is very helpful. We must focus on a real goal of finding a balance! Thanks Valeria, I’m pleased you found it interesting. Good luck with your new venture! What a journey! Sorry you had to hit rock bottom, and congratulations on getting back up and integrating healthy habits to get you to where you are now – you have come a long way! Caring for young children and starting your own business is probably just as stressful as working full-time in an organized corporate environment and paying for childcare. Thank you for sharing your experience! The decision of leaving your job and start a business of your own to combine with family life is very brave, and the article reminded me I also have to plan some ‘me’ time! Me time is so important – but like with all things, if it doesn’t get scheduled, it doesn’t get done. My big tip is to get your calendar out and write in some me time, right now, you won’t regret it! Such an interesting post! It is indeed quite a challenge to keep a good balance when we are working by ourselves but we need to keep it so that we can go further for a long time :). Yes that’s so true Cathy, me time gives us energy and the ability to think clearly and focus – so time out actually helps us achieve more in the long run.